First was that rumor it would take 40 days to reach Seattle. It began to float about latrines of Camp Hialeah when word came the 30th "boat" wasn't going to Boston After all. After a month or so at Camp Kanchrapara, in the swamps outside Calcutta, one was ready to believe anything. Hialeah was an overnight stop before boarding, and there the lieutenant colonels were kicked off the list to make room for hospital patients. And majors had their choice of going "troop class" or waiting for the GREELEY. Troops finished boarding S.S. MARINE ROBIN Sunday afternoon, Nov. 5. 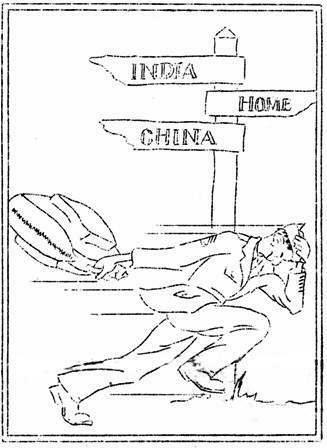 The manifest listed 2,572 veterans of China and India-Burma theaters, all but some of the top brass sleeping in five-tiered canvas bunks. Crew numbered 100 from the Merchant marine, plus 23 permanent Army personnel and 6 navy casuals. The 20,000-ton ship, owned by the War Shipping Administration and operated by Grace Lines was ready to head for Uncle Sugar, 8,700 miles away. So the band played a farewell tune. Expectantly, everyone waited. Nothing happened. The Prinsop Ghat was deserted except for a couple of urchins begging for baksheesh. And the ROBIN, waiting. We, the troops aboard the ROBIN, do not feel we are returning heroes, although we have pride enough and some of us sharp memories of those gone. There was unpleasantness but our gripes are said. Nor, for the moment, are we concerned about jobs and readjustment to a civilian future. We are just guys who want to get home for Christmas. May we be treated so. get over a sandbar. Thursday she really got underway, dropped the pilot, and Capt. H. Fischer, master, set the course. lt. Col. Thomas Bell, transport commander, and Lt. Col. Herbert F. Farmer, troops commander, made welcoming speeches, regulations were posted and the P.A. "radio" system, H-B-M-R, tuned up. Nov. 9, ROBIN sailed into the Bay of Bengal. Next day she was off the Andamans in easy waters, and by the 11th was navigating the Strait of Malacca, with the temperature 86 degrees. Steering the narrows was a tough job, particularly because of mines. A ship only a few miles ahead was damaged. Monday afternoon, the 12th, ROBIN anchored briefly in Singapore harbor for orders and a look-see, then steamed off, with Seattle the next scheduled stop. The ship was only a whoop and a holler from the equator. Published daily aboard S.S. MARINE ROBIN since Nov. 8, 1945, as a U.S. Army Special Service feature. Staff: 1st Lt. Whitley Austin, editor; Joe R. Ainsworth, cartographer and artist; T/Sgt. Daniel Boone, radio operator; T/3 Harold K. Joy, production; T/4 Thomas E. Wilson, circulation. Credit for great help is due to ship's permanent personnel, including Merchant Marine radio operators and Special Service staff. choppy seas, separated the men from the boys the 14th and 15th as the ship pitched off the Philippines. The islands were not seen. Early in the morning of the 17th, ROBIN was near Formosa (or Taiwan). She crossed the Tropic of Cancer and headed into the Pacific, following the "Great Circle" route - which is nearly a straight line, except on a map drawn on a Mercator projection, as most wall maps are. Cliffs of Okinawa were seen plainly on the 18th, and the rumor started the ship would be laid up for a week at Yokohama for engine repairs. When the transport skirted Tokyo bay entrance on the 20th, she didn't even hesitate. The snow capped peak of famed Mt. Fujiyama could be glimpsed. On noon that day ROBIN logged 414 nautical miles, an average speed of 17.6 knots. To keep up speed, fresh water evaporators, which use up engine steam, were slowed, and salt water was the rule, except for two hours daily, in the taps. Cold Weather After Japan North of the 40th parallel, the trooper skirted the Japanese island of Hokkaido and was 5,000 nautical miles from Calcutta. Temperature fell sharply and the heating system was turned on. Storms in the east Pacific failed to disturb the transport on the 22nd, enabling troops to eat a scrumptious turkey dinner and really enjoy Thanksgiving Day. Next morning the ship was off the Kuril islands, which could not be seen. Air temperature dropped to the low 40's, even at noon, as the Aleutians were approached. Because, however, of the Japanese current and westward drift, the ocean remained slightly warmer than the air and helped the transport on. International Date Line. Up to then it had been Sunday. When the line was crossed, it became Saturday the 24th again. But because a Sunday already had been started, it was decided to keep the day the Sabbath. And then the next day was really Sunday the 25th. This confusing business ended with the four chaplains aboard ship going into overtime, with services both Sundays, and with a major patiently turning his watch back 24 hours. On the first Sunday that was mostly a second Saturday, the ship's master's luck held; the ROBIN missed a storm of extreme intensity hurtling across its path, just as it missed 20 other storms which had plagued Pacific shipping during November. Captain Fischer kept his speed at 17.5 knots but warned of other storms ahead. Second appendix operation of the trip was performed in the ship's surgery on the first 24th. Somewhere off Dutch Harbor on the 25th, ROBIN encountered its first medium choppy water. Whereas in the China sea, she pitched, in the North Pacific off Alaska, she rolled - and rolled. Speed was cut down a knot and GI's without sea legs sickened. The skipper warned the final 2,000 miles would be rough and rainy. Sanctioned bingo games and unofficial crap games weren't the only diversions on the ROBIN. Sixteen hours a day something was provided by Lt. W. L. Johnson's special service, and Chaplain D'Arcy Littleton always had a service coming up. Major entertainment probably came from the public address "radio," HBMR. It provided programs ranging from canned favorites to live novelties like Chaplain Baskerville's singing. Exciting event was smashing of the hill-billy record, "Pins and Needles," by popular request. HBMR's staff was T/Sgt. George McLaughlin, S/Sgt. Jack St. John, Cpl. Bill Edwards and PFC Fred Newman. A double-barreled movie service was given by projectionists T/Sgt. C. R. Frasier, Sgt. J. R. Hopkins, Sgt. Ralph S. Phibbs and Cpl. Robert Wunder. Sgt. Al Gordon produced first rate soldier shows with assistance of T/4 H. R. Rempe's "Rhythm Kings." Boxing on deck was staged by Sgt. Jack Altman and PFC J. R. Finsen. Sgt. N. Lertzman took care of orientation while Cpl. Virgil Smith handled I&E. 1st Sgt. N. J. Dixon was aide to Lt. Johnson and PFC Walters. ROUTE OF S.S. "MARINE ROBIN" ON 15TH VOYAGE, FROM CALCUTTA TO SEATTLE, NOVEMBER, 1945. 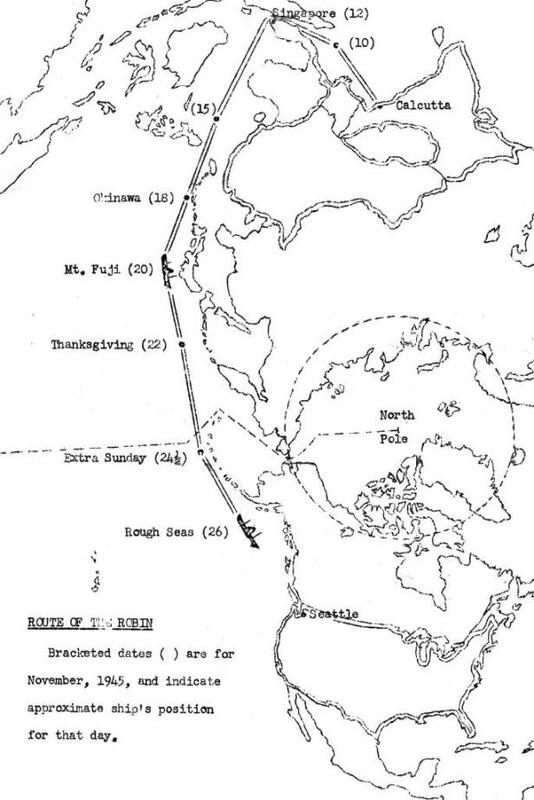 Map is drawn on a polar projection and illustrates the "Great Circle" route, in modified form, taken by the ship. The shortest route - impossible except for airplanes - would have been directly over the North Pole. The ROBIN went the shortest sea route possible, except that it did not go north of the Aleutians because of dangerous weather in the Bering Sea. Distance was approximately 8,700 miles. S.S. MARINE ROBIN was little more than 36 hours from Seattle this morning and - unless fate plays a last minute trick - was certain to be in port Friday. Captain Fischer and Colonel Bell said they hoped to have troops off by Friday night. The transport continued to roll thru froth-flecked swells yesterday at a speed of 16.9 knots, making 389 miles in 23 hours. Noon position was 49 deg., 16' North, 147 deg., 13' West or 1,029 miles to Seattle and 7,764 from Calcutta. While storm areas are to the north and behind the ship, the master said he did not expect any serious weather. He is keeping his fingers crossed, too. Thermometer yesterday showed 38 deg., with water seven degrees warmer. Troops on deck experienced a spit of snow as the skipper had promised a week ago. Although the ROBIN is in communication with the states, details of program after debarkation are uncertain. LISTEN to H-B-M-R for further news and details of landing. This is the final edition of the ROUND ROBIN. The ROBIN should enter Juan de Fuca strait late tomorrow, with the heather-covered slopes of Vancouver island on the port side and the state of Washington on the starboard. Friday, as the pilot works the ship through Puget sound, the Cascade mountains should be seen, particularly Mt. Ranier, 14,408 feet high. Of volcanic origin, it is a broadly truncated mass resembling an enormous tree stump with spreading base and irregularly broken top. Great arms of ice extend down the sides. Seattle probably will be chilly and damp. Average mean temperature for December is 43 degrees, and precipitation for the month normally is more than 5 inches. Metropolitan Seattle is a city of nearly a half million persons. By the 26th, increasing seas lurched the ship as much as 37 degrees and reminded the crew of North Atlantic voyages. A tail wind brought gusts up to 50 MPH. Although a few soldiers took nasty falls, crockery was broken in the galley and nearly everyone took to his sack, rough water didn't upset the ROBIN and she held to a better than 16-knot pace. Next day was calmer and troops were allowed on deck to enjoy the crisp air. Length - 520 ft; width - 71½ ft. Virtually every flyable American plane in India and Burma is being flown over the hump into China, presumably for distribution to the Chinese government, an AP dispatch from Shanghai said. Some 700 fighters and transports are involved in the flight and several of the planes have crashed with loss of life as they have encountered bad weather. On hop from Kunming to Shanghai, 11 out of 22 Mustangs crashed when the flight encountered a terrific weather front. Chinese troops are marching unimpeded toward Manchuria. They are within 90 miles from Mukden. HULL DENIES HE TOUCHED "BUTTON"
Cordell Hull testified before the Pearl Harbor committee that the charge the note he handed Jap envoys in November, 1941, touched the button that started the Pacific war, was "infamous." "Any reasonable person knows," he said, "that the Japs were bent on attack and knows we could not have stopped them unless we layed down like cowards." Administration's so-called full employment bill took another set-back. A House committee voted not to take up the bill but to work on a substitute bill. President Truman had already criticized the committee for delaying the measure. Not many of the troops aboard the ROBIN rode without working their way. Both officers and men staffed innumerable jobs, from MP to "head" details. And the chaplains were busiest of all. It would take nearly a roster of the ship to list all the GI assistants.